Competition is said to bring out the best in rivals. The adage must be true because from the moment Cadillac was incorporated by Henry Leland over one century ago, the company sought to produce cars that were ahead of its contemporaries. Many consider Cadillac’s smooth running and powerful V-16 engines, produced throughout the 1930s, as the best pre-war automobile engines in the world. In 1947, Cadillac outsold Packard, a leader in the luxury car field, for the first time since 1934 and continued to do so until Packard’s demise. The 1948 Cadillac’s brought the tailfin to the automobile and with the ’49’s came the advanced overhead valve V-8 displacing 331 cubic inches which provided significantly greater performance and fuel economy than the engine it replaced. It continued to be upgraded until it was finally replaced after the 1964 model year. Great styling and an advanced V-8 helped Cadillac maintain a sizable lead over its rivals, which included Lincoln and Imperial. Their success allowed for the opportunity to offer a costly image-building car dubbed the Eldorado in 1953. From the day the Eldorado became available for sale it was one of the grandest possessions of status-seeking individuals. Its name was synonymous with wealth due to the centuries old tale of the lost city of gold. With a list price of $7,750 a copy, it represented America’s most expensive production car and was the flagship of Cadillac’s luxurious fleet. Of course most people could not afford this model, but it drew attention to Cadillac dealerships filled with very prestigious Coupe DeVilles and Series 62 sedans that sold very well. 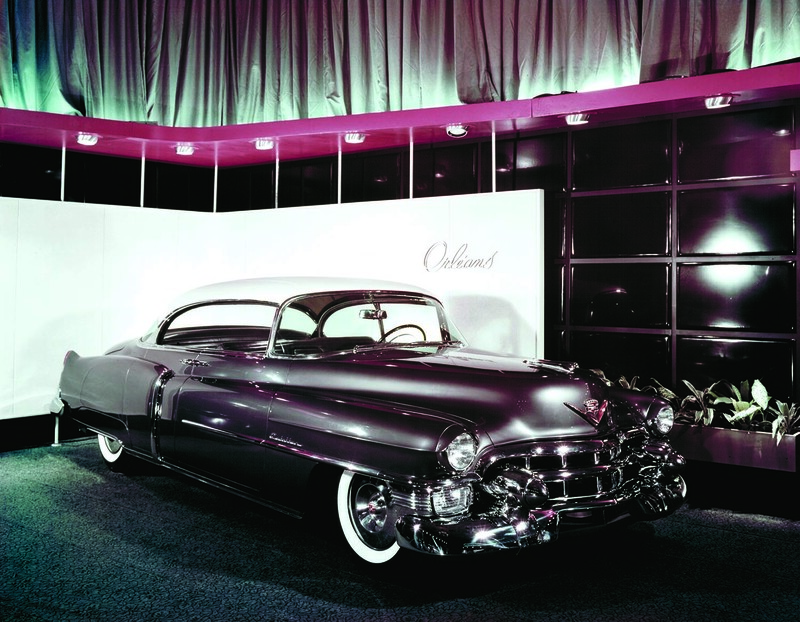 Cadillac’s cars ruled the luxury car market and the Eldorado represented automotive elegance taken to a higher level. 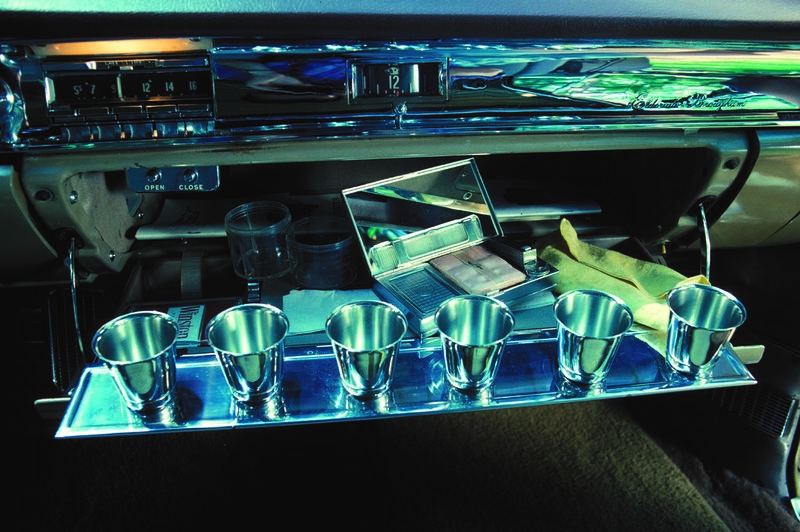 The elegance bar was set even higher four years later with the limited production Eldorado Brougham. 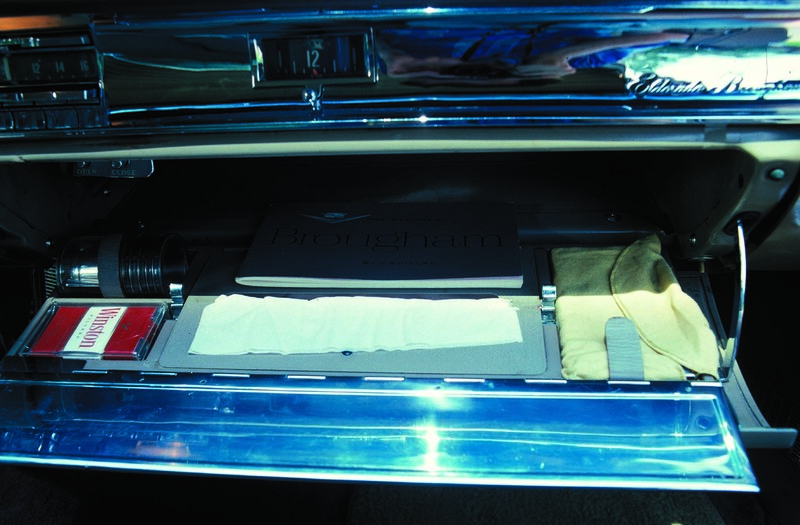 Like the name “Eldorado,” the label “Brougham” has its origins in the past. The term came from the days of the horse-drawn carriage with the driver seated outside in front. It is a name that is also associated with 18th and 19th century England; Henry Brougham, a political figure in that country in the 1800s, is credited with the design of the aforementioned carriage. The next prototype in the series leading to the production Brougham was another four-door pillarless sedan, the 1955 Eldorado Brougham, with design influences from the ’54 Park Avenue including an egg-crate grille and a brushed aluminum roof. It was also low in height standing only 54 inches high. In front were quad headlights, which at the time was not a legal setup in many states. The laws in those states had been changed of course by the time production Broughams became available. Reportedly, initial discussions between Earl and Cadillac’s general manager, Don Ahrens, resulted in a rejection of the Eldorado Brougham for production due to cost considerations. However, when word spread of Ford Motor Company’s plans to create the Continental division to produce their version of the ultimate luxury car, the Mark II, the issue of cost was no longer paramount. During this time, those in charge at Ford Motor Company were seriously attempting to close the sales gap between Lincoln and Cadillac. One facet of the plan to establish FoMoCo as a leader in the luxury car market was the creation of the Continental division. General Motors could not allow Cadillac’s status as the “Standard of the World” to be challenged. 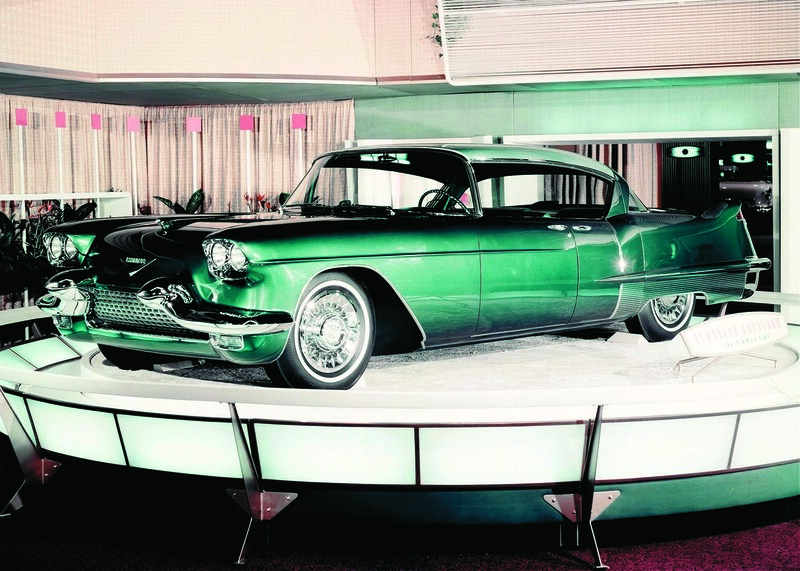 The final prototype Eldorado Brougham was constructed in mid-1955 and then displayed at the Paris Salon and throughout the 1956 GM Motorama tour. Additional tweaks to the car resulted in a grand luxury automobile offered to Cadillac buyers who desired and could afford the best car money could buy in 1957. Incidentally, another one-of-a-kind Cadillac, the Eldorado Brougham Town Car, was exhibited with the Brougham prototype. The Town Car, as the name implies, was a classic-era type chauffer-driven concept with a divider glass between the driver and the passenger compartments. This one was built of fiberglass instead of steel like the prototype and very likely never given more than a brief moment (if even that) of serious consideration for production. On March 18, 1957, GM began releasing Broughams to the dealers. The announced list price was a stratospheric $13,074 that was far more than the original target of $8,500. For the list price of the Eldorado Brougham one could have bought a new two-door hardtop from nearly all of GM’s auto divisions; that amount of money would have bought a Cadillac Series 62 ($4,609), Buick Series 40 Riviera ($2,204), Oldsmobile Rocket 88 Holiday ($2,854), as well as a Pontiac Chieftain Catalina ($2,529) and such a buyer would have still had about $800 to make a down payment on a new Chevrolet. Also notable is that the Brougham’s price was nearly $400 more than a ’57 Rolls Royce Silver Cloud. 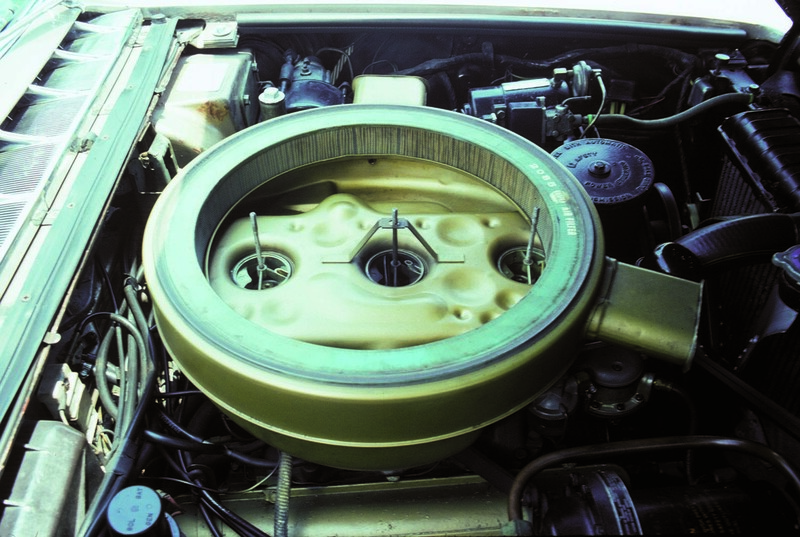 Originally, power disc brakes, Hydra-Matic transaxle, and fuel-injection were to be included as standard equipment for the Brougham, but with the costs escalating far beyond expectation these features were wisely eliminated. One more item that should have been dropped from the list of gadgets was the air suspension which proved troublesome due to the presence of so many potential leak points. Still it was the first of its kind to go into production (though Citroen had a hydro-pneumatic suspension in production a bit earlier). According to a report in the September 1957 issue of Modern Motor the leveling controls were so sensitive that they went into action the moment a door was opened. The setup was intended to provide a constant ride height regardless of the load and the smoothest possible ride – obviously highly desirable qualities for the finest car money could buy – but unfortunately as sophisticated as the system was (composed of four air spring assemblies, three leveling valves, a control solenoid assembly, and an air compressor and accumulator) it did not improve the ride qualities beyond those of a steel coil spring setup to the point of justifying the amount of trouble it caused Brougham owners. A road test report in the July 1957 issue of Motor Trend, showed a mildly enthusiastic attitude toward the air suspension among the test team. The writer explained, “A rough, busted-up three miles of ancient concrete road provided a good place to drive both a conventionally suspended Cad 60 Special and the new airborne Brougham. There is no doubt that the ride is amazingly improved, but riders and driver too (through the entire structure) still feel shocks; the edge or sharpness of the bump and rebound is taken away.” The sight of a new $13,074 automobile sitting almost flat on the driveway must have been quite a shock and maybe even an embarrassment to the owner. Most of the cars had the air suspension replaced with conventional springs. (Today, modern technology allows Brougham owners to have a reliable air suspension for their car if they so chose.) The experience, though, may have left more than one owner wondering, “What’s next?” However, the Brougham was as reliable as any other Cadillac without air suspension. The market for such an expensive car was a small one as Cadillac (and Continental) managers witnessed. Of course the market size was never the point anyway. Image was the reason for building the Eldorado Brougham. The Continental division was absorbed by the Lincoln division of Ford and the costly Mark II was dropped. Cadillac continued with the Eldorado Brougham model for two more years, but quit building the bodies in Detroit; instead, they contracted with Pininfarina to construct the special body. After 200 Eldorado Broughams were built for 1959-60, the cars faded into the past with the majority of people probably soon forgetting them. However, automobile enthusiasts know a treasure when they see one and the Eldorado Brougham is clearly one of those as far as many Cadillac fans are concerned. 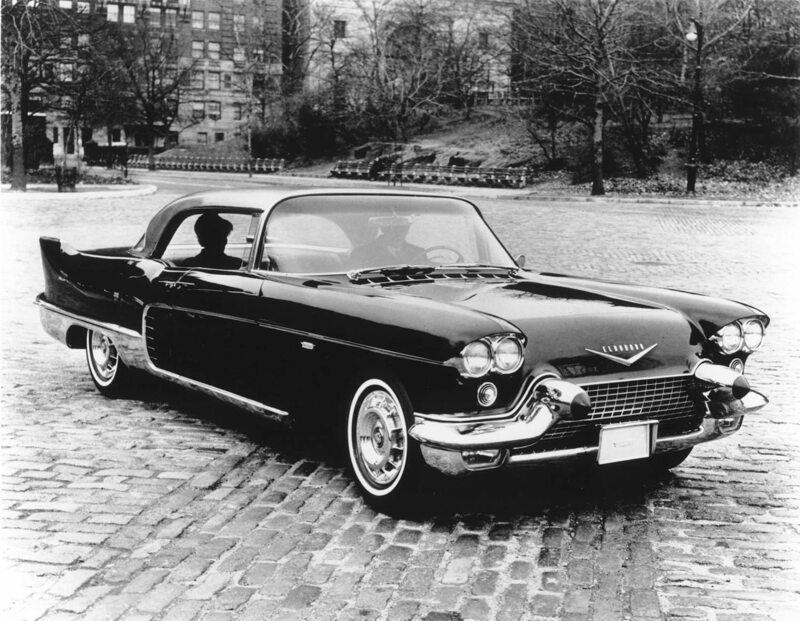 To date, well over 400 of the 1957-58 models are known to exist according to the Internet site, The Cadillac Database (www.car-nection.com/yann/Dbas_txt/indx2001.htm). Very few of these serve as parts cars. 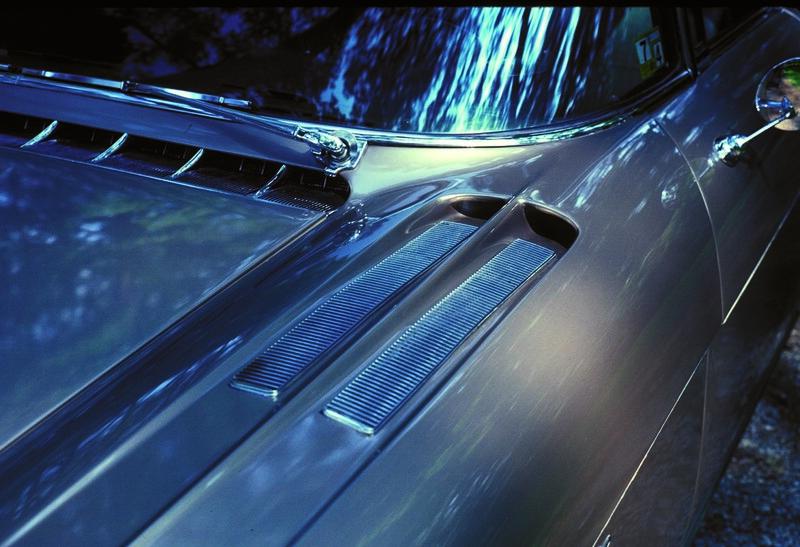 Restoring those which can be refurbished is an audacious task because Brougham body panels, much of the trim and all of the glass does not interchange with the 1957-58 Eldorado Seville (hardtop) and Biarritz (convertible) or Series 62 models though a large number of mechanical components are common to these cars. 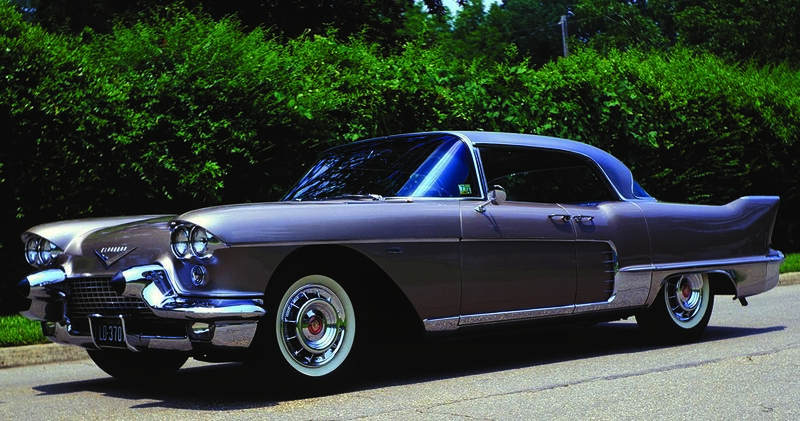 The early Eldorados and the 1959 Cadillacs were among the first to gain a high status among collectors years ago while the Eldorado Brougham has taken a while longer to be recognized as at least an equal to these impressive automobiles. However, as long ago as the late 1970s, there did exist a relatively small cadre of enthusiasts who recognized the special qualities of the car; their club was the Brougham Owners Association. It was dissolved in the ’80s, but was re-established some years later only to fade again with the passing of its president not too long ago leaving the Cadillac & LaSalle Club as the organization to join for those who are dedicated enthusiasts of the model. Asking and selling prices for the first edition Eldorado Brougham have risen well into the six figures for pristine examples. At long last, the half-century old design has been recognized by collectors for its unrivaled elegance and timeless beauty. Our thanks to Cadillac/LaSalle Club member Charles Barnette for allowing us to photograph #590, his lovely 1958 Model for this article. 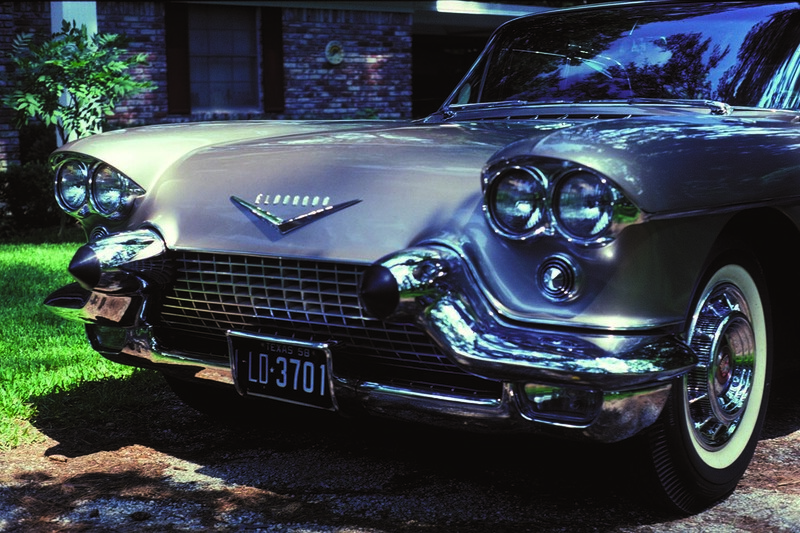 If you have an early model Cadillac or another collectible you’d like to insure with us, let us show you how we are more than just another collector vehicle insurance company. We want to protect your passion! Click below for an online quote, or give us a call at 800.678.5173.